CASTLE differs from community education in that the topics will be based on member requests & interests and led, for the most part, by retired or semi-retired professionals or educators who reside in the region. Possible courses could be a Founders Series including Ben Franklin and Thomas Payne, Everyday Chemistry, Writing for Legacy, Theatre Improv, U.S. Caucus System, Music of the Rat Pack and more. Become a Member, won't you? With your $100 annual membership fee the door opens to your CASTLE Lifelong Learning Institute. Fall, Winter, Spring terms with special events and at least 3 courses each, focusing on fun, friendship and college-level learning. Contact us at 507-354-3212, castleLLI@newulmtel.net and begin this new adventure with us! Drop the registration form in the mail with your $100 annual fee check. "Makes me feel young in spirit." "I keep coming back for the people and the quality courses." whether at twenty or eighty. C.A.S.T.L.E. – Community And Seniors Together Learning Environment, serves people regardless of previous education with classes in the humanities; art, history, literature, music, science and more. 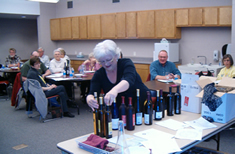 CASTLE Lifelong Learning is beginning it's seveth year of courses and has acquired over 95 members ranging in age from 50 to 75 years old. Our parent organization, Community And Seniors Together is a nonprofit, 501c3 organization, located at 600 N. German Street, New Ulm MN. 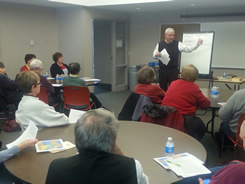 We have served New Ulm area adults since 1984 and beginning our 3rd year of lifelong learning.